– Inspires them to play in more purposeful, meaningful ways. – Inspires them to learn through those play experiences. – Inspires them to value what they have. – Inspires them to help maintain the space in an organised way. The space should feel nurturing and familiar at the same time as inviting children to explore and investigate by capturing their attention and provoking their interactions with the space. 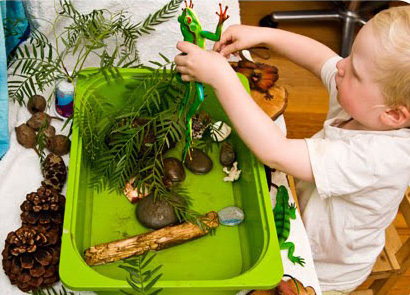 For more information about making play spaces inviting, visit Irresistable Ideas for Play Based Learning for simple but effective ideas to use at home or in a group setting. Encouraging children to see reading (and writing) as both enjoyable and useful from a young age can be achieved by engaging them with a range of texts. For example, a child who is less interested in story time may enjoy looking at and talking to you about the map of a zoo from a recent outing. The natural colours and textures of materials such as stones, seedpods, pinecones, tree blocks, and wool, make a nice change from the bright colours and flashing lights of many modern day toys. They also encourage children to play more creatively as seedpods become ‘food’ in their home corner play or pinecones a ‘family’ enjoying a day out. Before purchasing a toy consider if it is something which can be used flexibly, in many creative ways. These are they toys which will be worth the hard earned dollars you spend on them as they will offer an infinite number of new play scenarios, and not just now but for many years to come. Plants, photos in frames, thoughtfully displayed artworks, cushions – all create a sense of homeliness. By including objects important to the family, you have an opportunity to help children learn to treasure and respect their belongings and those of others. Children need time and space to play both alone and with others. By setting up an activity at a small table with just one chair (or alternatively two or more chairs), you are providing an indication of how that space should be used – like the space shown to the left, perfect for a single child to play in. Consider a balance of small, independent play and larger, collaborative play spaces when planning your space. Know when it is NOT so important to pack away and have a plan in place to store important works in progress. Read more about not packing away here. Children are given so much nowadays and they just don’t need it all, especially not all at once. To help keep children engaged with what is there, take away toys that they have outgrown or are not currently showing any interest in. Create special spaces for those toys your child is really interested in at the moment, you can find an example of how and why here. Most of us think more clearly when we work within an organised, uncluttered space. By planning an easy to access way of organising toys and materials, you empower children to make their own choices when playing, at the same time as making pack away time a whole lot easier. Where do your kids play? What do you love about your child/ren’s play space, or what changes do you wish to make? Great ideas here as always! :) I'm just in the beginning stages of planning out a playroom for my two boys, so this info will come in handy. This a great post! There are so many ideas here I could keep in mind while making over my boy's room (which I am currently doing!). Thank you for sharing all those great tips! :) And I can't wait to see the next post! Fabulous list.. totally nodding along while reading it! I'm all for your space/environment setting everyone up for success - life is so much easier for all that way! I would say that our play spaces are constant works in progress. As my children age, our play spaces change. My eternal issue is that I wish I had more storage. I really think that shelving, especially when low and accessible to children, makes a play space. You can see toys on shelves, unlike inside boxes, and it minimizes digging and so on. Unfortunately, we don't have as much space for this kind of storage as I would like. I agree Amber, storage is a constant issue, especially given how much 'stuff' children have nowadays. I just found your website and I feel like a kid in a candy shop! Your blog design, colours and, most importantly you've got loads of awesome information on integrating play from a parent and educators point of view. I love this post about creating play spaces for children to thrive. I'm also an Early Childhood Teacher and I'm also an aspiring picture book author, so I'll be visiting often for great ideas! Thanks. Thank you for the feedback, Fernando, and best wishes for your school spaces. This is such an inspiring post. It's given me some motivation to look at some areas in our home and change things up a bit (especially my boy's bedroom-- that's a difficult space for me for some reason). Thank you. Hi Christie, can I ask where the desk setup is from in the left-hand picture? (the one with the yellow stools) This is pretty much exactly what I'd like to do in my daughter's room; a small desk with those nifty holders for crayons, paint brushes, scissors, etc. I've been searching a bit online for nice craft desks but so many of them are cheap and plastic-y. Thnx, great article!